NAAMTA Accreditation is awarded to programs that demonstrate compliance through an extensive and comprehensive audit of business administration documentation, operational and medical protocols, licensures, training, and documented safety and quality management systems. There were no surprises, the NAAMTA managers & auditors thoroughly understand the air-ambulance business and have crafted their accreditation standards to reflect real-world operations at the highest-level of patient care; holding programs accountable to these exacting standards. NAAMTA Accreditation criteria and processes reflect the highest and best quality measures pertaining to all areas of medical transport services. NAAMTA Accreditation is required for government, and military contracts, such as contracts issued by the Department of State, Department of Defense, Air Mobility Command and the Department Veteran Affairs. Phoenix Air Group has been supplying military and government entities since 1978 and identify with additional support our accreditation provides. Program Director, Amy Arndt explains that NAAMTA Accreditation is awarded to programs that demonstrate compliance through an extensive and comprehensive audit of business administration documentation, operational and medical protocols, licensures, training, and documented safety and quality management systems. In addition to the documentation review, NAAMTA auditors conduct site audits to verify processes and record keeping, conduct visual observations, interview personnel, and establish solid relationships within the organization. NAAMTA is the first and only medical transport accreditation company registered as a ISO 9001:2008 Quality Management organization, and conducts all auditing processes using ISO 9001 auditing guidelines. "NAAMTA management and auditing professionals spent a great deal of time with our management prior to their arrival at our headquarters, so that we had a clear understanding of NAAMTA's accreditation processes," stated Dent Thompson, Vice President and Chief Operations Officer for Phoenix Air Group. "There were no surprises, the NAAMTA managers and auditors thoroughly understand the air ambulance business and have crafted their accreditation standards to reflect real-world operations at the highest level of patient care; they hold programs being audited to these exacting standards," Thompson explained. "After an onsite visit to our facilities in Cartersville, GA, the NAAMTA auditors selected one of our overseas bases and traveled there to perform an audit of how a field office performs when located thousands of miles away from our headquarters. NAAMTA accreditation guarantees to our clients that we are providing the highest level of medical transport services regardless of where we are operating around the world." NAAMTA is the vanguard for quality management and continuous improvement processes. As an accredited member, Phoenix Air Group becomes part of the NAAMTA Alliance. Our motto “Partnership in Lifesaving Excellence,” unites accredited medical transport providers in the continuous commitment to meet standard compliance and the ongoing development of industry best-practice procedures. NAAMTA champions medical transport accreditation, offering procedures that include guidelines for developing a system focused on transport safety, patient care, quality management, and continuous improvement. NAAMTA’s certified quality management system is audited annually by PRI Registrar, which is an ANSI-ASQ National Accreditation Board-approved Registrar certifying organizations to a variety of management systems including ISO 9001. NAAMTA makes great strides in identifying key best practices to improve the standard of performance among EMS and inter-facility providers at national and global levels. Through a dynamic approach to auditing and a vast array of web-based reporting and learning tools for members, NAAMTA distinguishes itself as the accreditation source for implementing and teaching quality management and providing services to their members working toward the world-wide improvement of medical transportation practices. 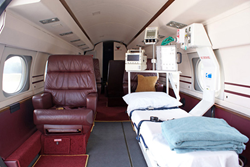 About Phoenix Air Group, Inc.
Phoenix Air has been providing worldwide professional air ambulance patient evacuation and transfer services for over 20 years. The company uses dedicated aircraft, which have been highly modified into “Emergency Rooms in the Sky.” Authorized by the FAA, Phoenix Air is among a select few private air ambulance companies contracted by the U.S. Department of Defense to transport DOD patients and dependents within the United States and to foreign areas of operation worldwide. Phoenix Air’s dedicated fleet of specialized air ambulance aircraft includes two long-range Learjet Model 36 aircraft, two back-up Learjet 36 aircraft, one Learjet Model 35 aircraft and two Gulfstream G-III aircraft. Each aircraft is dispatched as a Critical Care unit with appropriate medical staff on board to compliment the patient’s medical condition, all under the careful control of Phoenix Air’s Medical Director.